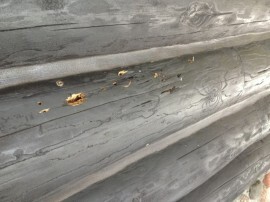 Problems with Log Homes – Woodpeckers can be a nuisance! Tell tale signs of trouble. Notice the circular holes. Those are from carpenter ants and the larger hole is from a woodpecker looking for the ants. There are a variety of problems associated with any type of construction and log homes are no exception. Just last week, I looked at this home near Clam Lake, WI where the owners had noticed that woodpeckers were damaging their logs. Upon closer inspection, it was clear that the log rot was the root cause of this kind of damage. When rot begins to take hold, insects (such as the carpenter ants) are attracted to this resting and food source (i.e. your HOUSE!) and then predators of the insects (woodpeckers) start pecking away looking to feed on the insects. So… you can see where I am going with this: The log rot is the root cause of the problem. We take away the food source for the ants and in turn, we have eliminated the food source for the woodpeckers. Log rot happens because of the logs getting wet so the ultimate cause of all these problems is moisture. Here are some links to more information if you would like to keep reading about log rot, insects and woodpeckers.